Check out the Wisconsin Department of Tourism (exit DNR). Wisconsin is finally moving into a period of dry weather after unprecedented rains in August and early September. There are still state properties that remain closed due to flood damage, including Wildcat Mountain State Park and the Elroy-Sparta, 400, portions of the Military Ridge and other state trails. Many waterways across the state are extremely high and slow-no-wake ordinances remain in place, including the Madison lakes, and portions of the Rock and Wisconsin rivers. The lower Wisconsin River has been setting record flows for the dates in September based on 100-plus year data collection. There are no sandbars and with this much water there are all sorts of hazards such as strong currents, underwater obstacles and floating debris. Due to the multiple storms this week low numbers of anglers were out on Green Bay. Walleye fishing has slowed but musky fishing was picking up with one pair of anglers reporting catching a 54 incher and others catching a few at 49 inches. Yellow perch fishing also appears to be picking up with some boats catching more than a dozen. Door County bass action has slowed a bit in the last week but some pier anglers are still catching some nice fish. Choppy water, rollers and fog made fishing conditions difficult on Lake Michigan. Pier fishermen have waited all year for the opportunity to catch fish off the Manitowoc and Two Rivers piers and chinooks and brown trout have finally been caught daily. Salmon have been spotted inside the Two Rivers harbors and may be headed up the rivers already. Many hunters on public lands had good success with the teal duck season. There were a fair number of blue wing and a few green wing teal present. Turkeys seem to have had a great hatch this past year as they are commonly seen in fields in large number this time of the year. Northern Wisconsin saw some brisk morning temperatures around 38 degrees this week and more fall color is visible in the woods. Walnuts, hickories and acorns are dropping. Deer have been seen eating under mostly white oak trees. Some bucks are still being seen in velvet, which seems a bit late. Cow and calf elk groups are being approached by bulls for the start of the mating season and the bulls are bugling. 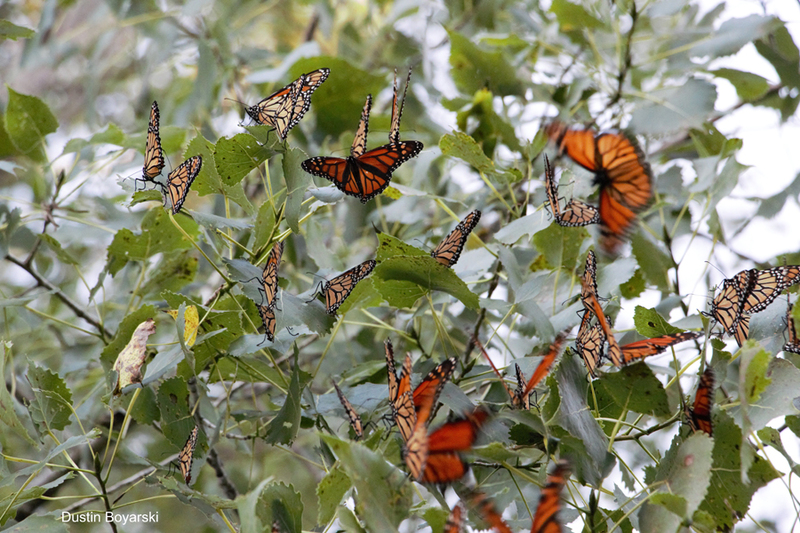 Large groups of the butterflies often roost together in trees overnight, and the rainy weather and winds have slowed their migration. Large numbers have been reported at annual fall migration roost sites in Waukesha, Marathon and Winnebago counties among others. People can see where these roosts are being reported and help track and study the monarch migration to aid conservation efforts. Reports of monarch roosts and peak migration can be made through the Journey North website at journeynorth.org/monarchs (exit DNR). Thursday morning Wisconsin saw a massive migration of millions of birds with a front that moved in overnight. 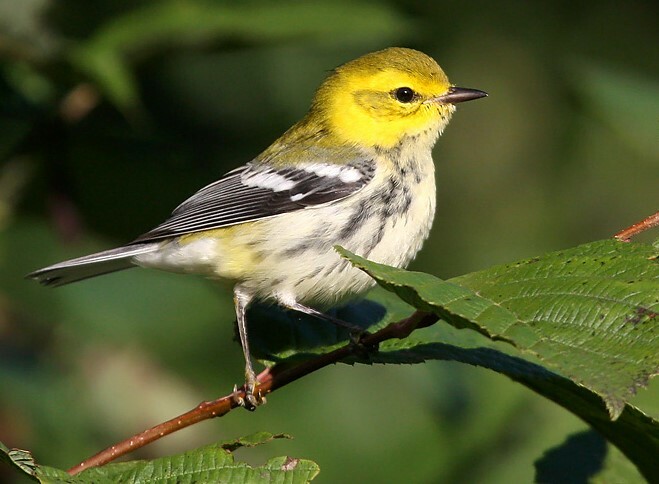 Southern counties are now earnestly into the warbler migration, and resident birds continue to depart, making orioles, grosbeaks, buntings, tanagers, flycatchers and hummingbirds less common each day, especially up north. It's snapping turtle hatching season so drivers are urged to use caution and watch out for the little guys trying to cross pavement. Monarchs have begun their long journey south to Mexico. The substantial amounts of rainfall have had made for great conditions for a variety of mushrooms and Door County naturalist Charlotte Lukes will lead a mushroom hike this Saturday at Newport State Park. For this and other events search the DNR website for "Get Outdoors." Willow River State Park - Yoga in the Park! September 8, 9-noon Bluff Creek Workday: Collecting seed - Come enjoy the fall flowers and help volunteers at during our monthly Southern Kettle Moraine SNA workdays. Pick seeds, learn something, meet knowledgeable people, and enjoy the beauty of this rich remnant prairie/wetland in the process. We need this seed to plant areas of brush we've cleared and will clear in the winter. The seeds will be planted in the bare areas to encourage native grass and wildflower establishment. No skills needed you will be trained onsite. Mushrooms are abundant in the forest. Good air quality for Wisconsin on Friday, April 19, 2019 at 3:28 am CT.